Vito Screen Capture lets you take screenshots of your Pocket PC from a desktop PC. 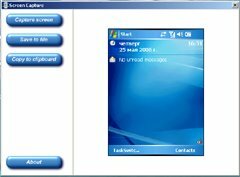 VITO Screen Capture automatically detects your Pocket PC or Smartphone when you connect it to your desktop PC and start ActiveSync. Now you can capture the screen image on your Pocket PC. It is immediately dispalyed on the desktop PC, you can save it as a bitmap image file or copy it to the clipboard.